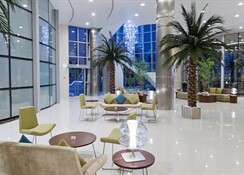 Novotel Abu Dhabi Gate is located on the end of the Creek between Abu Dhabi Gate City and Bain Al Jessrain.The 4 star Novotel Abu Dhabi gate is featuring 160 spacious rooms as well as 64 one bedroom apartments, conferencing facilities. 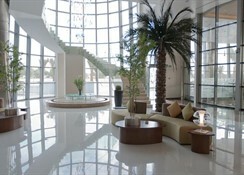 The 3 restaurants serves in the morning an extensive quality breakfast buffet with oriental specialties. For lunch and dinner we offer an international buffet with a wide variety of food on 7 days a week. Indoor and outdoor dining is offered. Modern and trendy pool bar is located on the pool deck and features snacks, all kind of fancy drinks and a Shisha lounge. 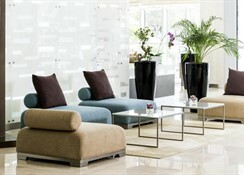 There are many comfy sofas and seating to relax and enjoy the nice view and weather. 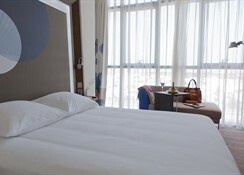 This popular hotel is a choice for business or leisure, with the beautiful SZ Grand Mosque right at the doorstep. A modern spacious room with King bed or two single beds, en suite bath/shower, large ergonomic work area, 26" LCD TV with pay movies and internet access, broadband connection, hair dryer, minibar, tea/coffee. 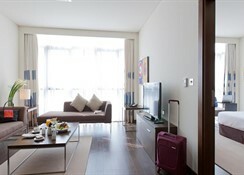 Up to 2 adults.The Suite offers a living room, bedroom, bathroom with shower and bathtub, and separate toilet. Free WIFI and minibar, iPod dock, Nespresso coffee and tea, wellness kit with bathrobe and slippers.Fully equipped kitchen with dining and living area, our 32 one bedroom apartments are spacious, contemporary in design and comfortable. They are truly a place for living which are perfectly designed to serve all your needs. Horizon Restaurant: Enjoy an extensive quality breakfast buffet with oriental specialties. For lunch and dinner there is an international buffet with a wide variety of food, Wok&Co: In the evening you enjoy a well-balanced meal without borders in a trendy setting; Gabbiano Restaurant & Bar: Discover a menu with true Italian flavors and spirit; Al Nasser Bar: Enjoy a cold refreshing drink at this outside bar, combined with a light snack and closed with an Arabic coffee and a Shisha, Fusion Lounge: Cold and warm snacks round the clock; Aroma Cafe: Coffee specialties, Danish pasties, sweets and cakes. 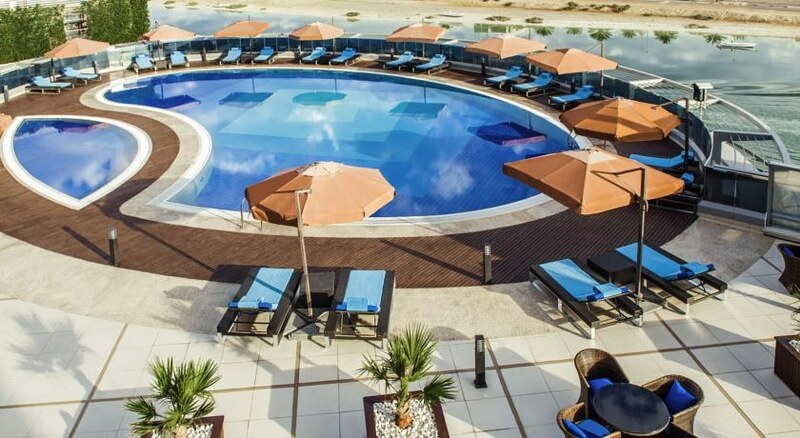 This contemporary hotel, in a tower set along the Al Maqta Canal, is 8 km from the Sheikh Zayed Mosque and 12 km from the Dalma Mall.